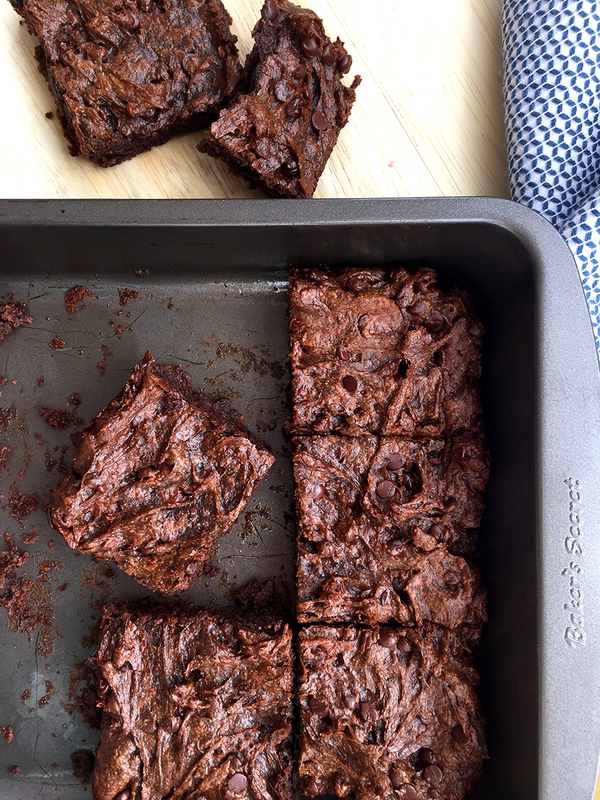 These flourless brownies are seriously delish, only take about 15 minutes to prep (faster if you don’t stand around licking the spoon like I did… no raw egg, so why not?) and feature some rockstar ingredients. Are you ready for this? ALMOND BUTTER and AVOCADO. Yep, totally flourless brownies that include two of my favorite things with a double chocolate twist from cocoa and chocolate chips. The finished product is a brownie with that must-have delicate crispness on the top and sides and a dense and chocolate-y chewy center. I couldn’t eat just one, I MAY have cleaned off half the batch in a day. 😉 The only tweak I’ll experiment with next time is adding some strong black coffee. Yum! P.S. These are also vegan (depending on the type of chocolate chips you buy) so everyone can enjoy. These 100% flourless brownies are made of almond butter and avocado for a healthier version with a crisp outside and rich, chewy inside. Preheat the oven to 325° F. Grease an 8" x 8" cake pan with coconut oil, set aside. In a food processor, with a mixer, or by hand, combine the first six ingredients. Then stir in the chocolate chips, and transfer to the pan. Level out the batter (will be very thick and sticky) with the back of a spoon, edging it into the corners and smoothing the surface. Bake in the preheated oven for 30 minutes, then remove and allow to cool to room temperature before slicing and serving. Aw, thank you! Love it when you stop by… xoxoxoxox! I just got a fancy jar of nut butter that would be perfect for these! Thanks for sharing! I bet these would work with sunbutter, too. Hmmmm… must make again as nut-free version! Next week I should hopefully have almonds and chocolate back in my life, and when that happens, these brownies happen. Yay for egg-free baked goods! Hidden avocado! I love it!! I love avocado plain, hidden in brownies, on eggs, in smoothies… it’s seriously one of my favorites! Fabulous! I can’t wait to try this recipe. Oh boy….I just ate fish tacos for lunch and am stuffed. But that didn’t stop the massive brownie cravings! Gorgeous and decadent. Bravo! I need to make these again, STAT. I have the massive cravings, too! I’m amazed how little sweetener you managed to use, wonderful! Well, I have to admit that the full CUP of chocolate chips contributes quite a bit to the sweetness! I LOVE brownies! These look delicious! OH MAN girl – I want these like right now! Making this for my little girls this weekend! Thank you! I can never resist a chewy brownie, especially one that only takes 15 minutes to make! This looks delicious! Must make them soon. Thx Rachel! Do you think these would be good made with cashew butter instead? I think the color will be lighter and the flavor a tad different but I think it’s worth a try! 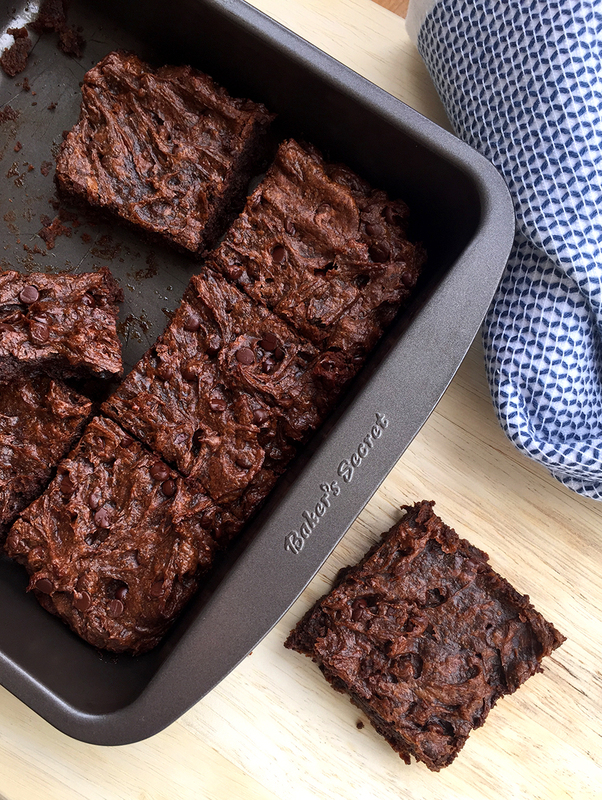 I have been making paleo recipes for almost 4 years, and I’ve gotta say… these brownies are truly amzing and so simple to make. Thank you so very much ! You’ve been making paleo recipes for longer than I have! So glad you enjoyed. I’m so delighted that you tried them! i’d love to make these with less nut butter – do you think I could replace half of the nut butter with apple butter, pumpkin, sweet potato, banana, or something like that?? Sweet potato might work… something pretty meaty. I made these tonight they are soooooooo good. I was worried by the lack of egg but pleasantly surprised. I doubled the recipe and made it in a bigger pan and turned out great. They are so chocolately and moist it’s hard to believe its avacado in there! What other thing could be used instead of the nibs? If adding the coffee to this recipe — how much and any other adjustments? Sorry, I haven’t tried it yet! Ha, completely slipped my mind.